Starpath was established in 2005 as a Partnership for Excellence led by the University of Auckland in partnership with the New Zealand Government. The project continues with support from the University of Auckland and is based at the Faculty of Education and Social Work. As the first navigators crossed the Pacific they followed the stars from island to island. At the beginning of their journey, they found the star which marked their direction, and followed it until it sank towards the horizon. 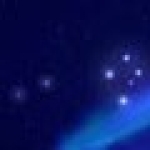 Then they located the next star on the star path, and the next, and the next, until they reached their destination. The Starpath Project for Tertiary Participation and Success was established in 2005 to undertake high quality research and implement an evidence-based school-wide intervention aimed at improving the educational outcomes for students who are currently not meeting the criteria required to progress into degree-level study and, as a result are under-represented in tertiary education. In particular, the three-phased project has worked in partnership with a selection of secondary schools in Auckland and Northland to identify and address the barriers that prevent participation and success in degree-level education especially for Māori, Pacific, and other students from low socio-economic communities. Funding for Phases One and Two of the project was provided by the Tertiary Education Commission on the basis that The University of Auckland raised matched funding from the private sector. Foundation North (formerly the ASB Community Trust) provided substantial funding, through its Māori and Pacific Education Initiative, to support Starpath's ongoing research and development. Funding for Phase Three is provided by The University of Auckland. The Starpath Project aims to increase achievement at NCEA levels 1-3 and UE attainment for Māori and Pacific students, and for other students from low socio-economic communities. In early 2016 Starpath announced it was to receive a further two years’ funding from the University of Auckland to continue its work to raise student achievement in low decile schools. This gives the Project the opportunity to continue the critical learnings from its work with 39 secondary schools in Phases One and Two. Starpath’s efforts are now focused on a smaller number of low decile schools which are committed to the Project and have high numbers of Māori and Pasifika students. 1. To focus our efforts on low decile schools with high numbers of Māori and Pasifika students within Northland Tai Tokerau and Auckland Tamaki Makaurau, where Starpath has established relationships. 2. To work with fewer schools using a stronger evidence base. 3. To continue to raise achievement in these schools. 4. To introduce strategies to younger students by working with Year 9 and 10 students. 5. To enrich subject specialty literacy learning (increased opportunities to learn), academic counselling and parent student teacher conferencing. 6. To increase student and whānau family engagement in academic decisions earlier for students. We will continue to learn by modelling an evidence-based approach using data to refine what things we do and how we do them. Starpath is working with Phase 3 partner schools to develop a ‘stretch target’ for UE attainment. The project is emphasising UE as the highest qualification students can gain from their secondary education. In 2011, the Starpath Project was awarded vital funding to implement Starpath’s strategies for success in 39 secondary schools in Auckland and Northland, including further collaboration with the original five partner schools. During Phase Two (2011-2015), Starpath implemented and evaluated the Data Utilisation Academic Counselling and Target Setting programme that was trialled and tested in Phase One. 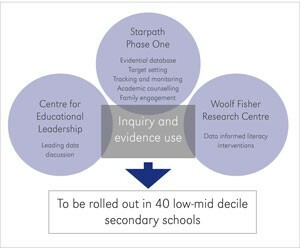 In addition to using the evidence from Phase One, Starpath used the intervention evidence and experience from two partner research and development teams at the Faculty of Education and Social Work. The teams at Starpath, the Woolf Fisher Research Centre and the University of Auckland Centre for Educational Leadership worked together to implement and evaluate a programme which was designed to have the fullest impact on educational outcomes for Māori and Pasifika students and students from low socio-economic communities. The work with Phase One indicated that literacy was a barrier for some groups of students at NCEA Level 3 and University Entrance. The Woolf Fisher Research Centre worked alongside Starpath partner schools to enhance instructional effectiveness in literacy. Improving subject specific literacy, and providing support for literacy leaders in partner schools, was also one focus of the PLD delivered by the schools team in Phase Two. During Phase Two, the University of Auckland Centre for Educational Leadership worked with Starpath to further enhance leadership effectiveness in each of the partner schools, especially in the area of senior leadership. There was a particular focus on the extent to which the Starpath Project and schools leaders succeeded in developing a coherent focus and on the properties of effective leadership including: strategic planning and solving complex problems. During Phase One (2004-2010) the Starpath Project conducted extensive research in partnership with five secondary schools in Auckland and Northland to identify and address the barriers to student success, raise achievement and increase participation in degree-level education. A detailed understanding of educational dynamics in New Zealand. A toolkit of proven initiatives and approaches for schools. A strategic, evidence-based approach to enhancing educational achievement. Improved methods of collecting and understanding data in schools. In the early stages of the project, Starpath worked in partnership with Massey High School in West Auckland to evaluate an academic counselling and target setting programme designed by the school to raise student achievement, improve communication with parents and whānau and provide appropriate advice to students on academic pathways based on their NCEA achievement records and aspirations for the future. An evidential database to allow for the systematic storage and management of real-time data within schools by appointed and trained staff to inform decision making. A specially trained staff member to use longitudinal data to set individual academic targets and aggregate these with other data to set specific group and school targets. Real-time student achievement data to monitor student learning and academic progress. A 'traffic light' system to record teachers' expectations of students' achievement in individual subjects as part of monitoring and aligning academic targets and progress and ensure timely interventions with students at risk of not achieving targets. Academic counselling or coaching to provide the opportunity for students to meet with trained teachers two to three times each year to review their academic progress, goals and plans and the strategies required to achieve them. Enhanced parent-student-teacher conferences to provide schools with the opportunity to discuss students' progress collectively and improve community engagement. Plans and strategies are reviewed with students and their family/whānau using real-time data and other relevant information. These strategies have become the key elements of Starpath's Data Utilisation, Academic Counselling and Target Setting Programme. An evaluation of the Starpath strategies implemented in Phase One showed associated increases in student achievement in each of the five schools as well as a number of other gains related to staff professional development, student engagement and community relations. Schools maintained an evidential database to inform their planning and teaching practices. Principals reported a closer alignment between the schools' strategic plans and practices designed to improve student achievement. Staff reported that having up-to-date data enabled them to have more positive conversations with students and teachers valued the academic counselling, seeing it as an essential part of their everyday practice. Significant changes in levels of achievement occured after the Starpath programme had been put in place. One school increased Level 3 NCEA results by 18% while another has taken its Level 1 pass rate from 40% to 60% and its Level 2 rate from 40% to 58%. Redesigned parent-student-teacher conferences had a significant impact on community engagement. Parent/whānau/fanau attendance increased from around 20% to between 70% and 80% in each of the five schools and feedback from parents was overwhelmingly positive. More detailed information about research and development undertaken in collaboration with the five partner schools in Phase One is available in the Starpath research reports and a more detailed summary of the main findings from Phase One is available in the 2011 Annual Report.